On the occasion of the New Year 2014, H.E. Tran Hai Hau, S.R.V.N Ambassador to Singapore together with the Embassy staff paid a visit to the leadership and staff of Petrolimex Singapore. 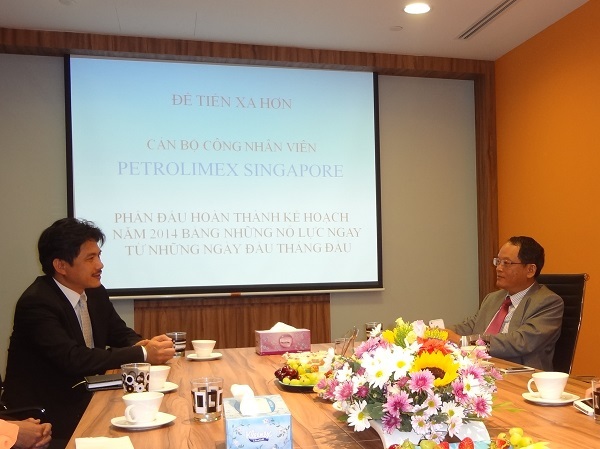 Commending the collective leadership and staff of Petrolimex Singapore upon their achievement over the last year, H.E Tran Hai Hau cited that the achievement reaffirmed the positive contribution by Petrolimex Singapore to the increased trade between Vietnam and Singapore, benefiting national economy. Copyright © PCC1-HT&T Petrolimex (Thailand) Co., Ltd.